It is thirty years since Dill Katz and Colin Dudman founded Premises Studios in Hoxton. 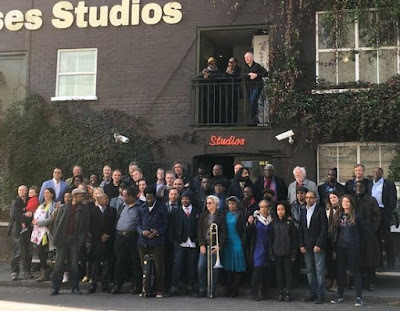 Today a mighty collection of British jazz musicians who have worked at the studios assembled there for a photo in the spirit of Art Kane's "A Great day in Harlem". Courtney Pine and Talvin Singh were interviewed by Alice Bhandhukravi for BBC London TV News. Thanks - we were hoping someone would do that. Any more? !